Management at Big Bear Lake, a Southern California retreat, wanted to deliver great visitor experiences and grow tourism without getting tangled up in IT complexity. A cloud-managed wired and wireless solution gave the visitors center the network capabilities it needed and keeps operations simple. Why not consider NaaS or Network as a Service while you are considering UCaaS. Either way Blue Chip has excellent partners to keep your WiFi and wired networks, safe, secure and running smoothly. Our key partners provide a Unified Communications approach to unifying the management of their network. Through Juniper Sky Enterprise we provides simple and easy cloud-based management to reduce costs and simplify management. From a single pane of glass you can deploy and manage enterprise Juniper SRX FIrewalls, swithces, and wireless Aerohive access. Whether you want Blue Chip to manage your network or you wish to do it yourself, Juniper Sky Enterprise provides simplified management and lower operations costs of your security, wireless network and wired networks. Simple: Deploy, configure, and manage devices within hours for immediate visibility and control through one dashboard. Secure: Centralize policy management including next-generation firewalls and secure router functions. Open: Designed for multiplatform and multivendor architectures, Juniper Sky Enterprise supports Juniper Networks EX Series Ethernet Switches and SRX Series Services Gateways, and also integrates with other systems. Cloud based Wi-Fi delivers a secure, reliable and cost-effective network experience to every user, regardless of location or device. This cutting-edge solution can help reduce costs, increase performance, enhance security, simplify management and improve user experience. Blue Chip has a number works with a number of vendors so that we can provide the best experience of Wi-Fi networks as a service. 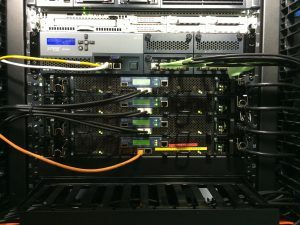 Unlike traditional hardware-based legacy solutions, cloud networking automates highly complex tasks to make them extremely simple, enabling enterprises to deploy locations in minutes and operate distributed networks with services delivered via a cloud infrastructure, while providing unprecedented levels of centralized control and network visibility. Cloud services are usually subscription-based as well, reducing any upfront capital costs. We are able to supply you with a 60 day Wi-Fi Evaluation by completing the application. The world’s biggest and busiest wired and wireless carriers, content and Internet service providers, cloud and data center providers, and cable and satellite operators run on Juniper Networks. As do major banks and other global financial services organizations, the world’s top-ten telecom companies, national government agencies and U.S. federal organizations, healthcare and educational institutions, and energy and utility companies. Juniper Networks is Blue Chip’s preferred network providers because they supply high quality secure network infrastructure with a low cost of ownership. Additionally, it fits in with our model to provide premium network as a service to our customers as a service. Juniper Sky Enterprise is a subscription-based cloud management service designed to abstract, simplify, and hide network complexity from branch and campus customers. Distributed enterprises have traditionally run management software on their own IT infrastructure, a process that required long planning cycles, careful pre-staging of devices, onsite IT staff at branch locations during deployment, and ongoing management, all of which contributed to prohibitively high installation and maintenance costs. With Juniper Sky Enterprise, customers no longer need to purchase, install, and maintain servers and management software in their own environment, allowing enterprises to scale capacity up or down based on existing business demands. Juniper Sky Enterprise, which is updated regularly with the latest secure software and features, enables the network to be managed centrally with minimal input from IT, allowing staff to focus on core business activities, and ultimately realize significant CapEx and OpEx savings.